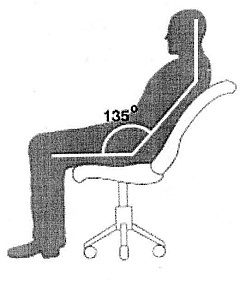 This posture reduces pressure on the spine when you are seated. 2) Don't sit for long periods of time. It is a good idea to periodically (hourly) get up and walk around a bit. 3) Instead of driving, walk to destinations when it's reasonable to do so. This is another way to reduce the time you spend sitting down. Keep object that you are lifting close to your body. Try not to twist at the waist while you are holding object. Try to keep your spine in a neutral position. If you have to reposition, move your feet. Use the strength in your legs to do the lifting, bending at the knees. 5) Include core training in your exercise program at least 2-3 times per week. 6) If you need to grab something out of your reach, use a step stool.